This event marks the 75th anniversary of the sinking of the cruiser USS Juneau (CL-52) in the Naval Battle of Guadalcanal and subsequent loss of all five Sullivan brothers. This event will start at 10:00 am in the Hangar Bldg. 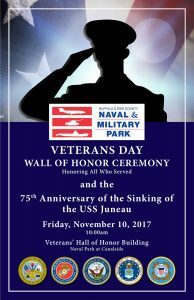 The Wall of Honor Ceremony will be combined with the 75th Anniversary of the Sinking of the USS Juneau in which the five Sullivan brothers died.